Thanks for the auspicious writeup. It in truth was a amusement account it. Look advanced to far added agreeable from you! By the way, how can we communicate? hi catharus, "Guess What?" "I got a little story to tell you.." "If it wasn't for 'FDR'.. we'd be dead.. or.. NAZI..!!!" ..JD..
Re the Kennedy assasination: I do not think that Oswald's trip to Mexico City (if in fact that was Oswald) provides the key. Rather, what Oswald did and who he associated with in New Orleans from April to September of 1963 is the Rosetta Stone of the mystery. In the very first days of the FBI's post-assasination investigation, David Ferrie, a known employee of Carlos Marcello, was on the radar screen. I think Marcello, Trafficante, Giancana and Hoffa pulled the hit job off, and RFK was the architect of the coverup, because a thorough investigation would have revealed that the US was actively involved in attempting to assasinate Fidel Castro, a fact which if revealed would have caused very bad problems with the USSR. I am fairly sure that the things LHO learned in NO caused him to begin to make plans to "defend Castro and his revolution". But the people and influences of Mexico City were such that he was put on a course to become a MAJOR political force. of the covert operations against Castro's regime. Your exactly right that Marcello ordered the hit on both Kennedys! Traficanti was the assasain contractor and Oswalds trip to Mexico was to talk to his accomplice on the knoll at Dally Plaza, a French hitman now dead! It is more then obvious that Kennedy's head was hit from the front of the vehicle from the knoll as the back of his head came out in a large piece that Mrs. Kennedy fetched off the back of the Limo! Did Oswald fly to the ground in front from the book depository and shoot another weapon?? Of course not and so the Warren Commission was a intended whitewash by the government to keep the CIA from being ended! CIA trained some of the Cubans that made it back from the Bay of Pigs and got even! They provided the weapons and FBI got a warning call from Miami the night before of an ambush of the motorcade! They recommended the bullet proof limo but Kennedy refused! Big mistake! Marcello and other Mafia members were pissed about Joseph Kennedy a "bootlegging banker" for the Mafia asking for contributions for JFK's election and then Bobby announced he was going after the mob as Attorney General! The assasination involved Bay of Pigs Cubans "Alpha 66" Bay of Pigs Survivors, a French hitman now dead in a French prison and Lee Oswald! The CIA stands for Corporate Intelligence Agency and not Central Intelligence Agency!!! The 1960 Presidential Election was the most mobbed-up election in US history. Both Kennedy and Nixon took mob money. RFK, however, was so naive to believe that if he only went after the mobsters that donated to Nixon there would be no problems. It doesn't work that way; those mobsters are all connected by a complex network of alliances. The assination was a result of a perfect storm, at the intersection of p-o'ed hoodlums, disgruntled anti-Castro Cuban exiles, and elements of the CIA who were scared to death Kennedy was going to break up the Company. I have doubts that Oswald pulled a trigger. He was found in the second floor break room of the TSBD, calmly drinking a Coke, 90 seconds after JFK's head was blown off. Please, please, please ... get back on those meds baby. Wow! Somebody put a little to much flake in their corn this morning!!! ROFL!!! This is CNN, Not the Christian News Network. Try Google and find the right place to post your rant!! religion has no place in POLITICS!!!!!!!!!!!!!!!! some of you missed the point, he was human, he wasn't a methodical machine, he was a normal human being ACTUALLY trying to make things right, most poignant moment was the Cuban missile crises, The war-mongering generals where ready for Nuclear aggression as if there was no option (hits close to home ehhh?) and yet this man found the strength somehow to not bow down to lies that where apparently thrown at him, It's thanks to him mostly likely that all of you are here today and not letting Judgement day come to be, much can't be said for the people in charge for the last 30 years. You know, when I clicked on the article about "secret tapes of JFK", I was truly hoping to get a mixed language paean to Christianity. No wait, that was last Sunday when I went to church. On second thought, although I'm sure some of us really appreciate the sentiment, COULD YOU PLEASE STICK TO THE TOPIC??? Politics are always so arguable. I agree with Bill just based on what we learned in high school and college. They were great men focusing on civil and equal rights, conserving our beautiful land....there is so much to argue, but that's the thing it was all unfinished which is why it is an argument. Had they lived none of us would want to listen to the tapes, or think about what the future could have been. But bc their time was cut so short, and what was accomplished in such a short span was enourmous, every mind interested in history and government has pondered that thought. All we have are the tapes and photos of glimpses into their lives and how they worked and processed and when something unheard of. Is released it really is interesting. I am all for tapes being released bc their is so much mystery to the past. Especially when it was cut so short. Okay, you all got me thinking about this... Really one last and final thought. I also believe Teddy should have been convicted of manslaughter. And other bad behaving relatives of RFK and JFK have tarnished the reputations of these two men. When I think Kennedy, my mind goes to spoiled, arrogant, entitled jerks. But I'm not thinking about RFK and JFK – it's the latter generations of these men, who hurt history. But when I separate the brothers from their clan, there is no confusion for me. We would have been better off. I agree with you whole heartily bill, about Teddy and about the Kennedy clan that tarnished that name. One more thought on this... The other option in Kennedy's election was Nixon. Nobody can say Nixon was not the antithesis of great. Aside from being corrupt behind closed doors, he is the one who turned health care into a money making machine for conscious-less corporations. So... when calling Kennedy a terrible president – perhaps he made mistakes, but if we judge the man he had a great soul and an honorable mission. So few presidents can be compared. And again, we will never truly know how he would have ultimately faired had he not been murdered. But I believe he is on the right side of history. As is his brother. JFK and Bobby are most definitely on the right side of history – their ability to connect with people from all walks of life and genuine compassion is unsurpassed. JFK was also a true war hero, unlike most of the politicians today who freely 'talk the talk' but haven't taken that walk. Well, you're entitled to your opinion, of course, but in spite of your attempts at even-handedness in your remarks, you reveal yourself to be a partisan Democrat. That's fine, but don't use terms like "one cannot argue that Nixon was not the antithesis of great" if you want to be taken seriously. Maybe Nixon wasn't the greatest president we've ever had, but that puts him in the same category with over 40 others as well. One day, hopefully soon, Obama will join the pantheon of terrible presidents. The debacle in Libya that he is covering up got people killed, unlike Watergate. I know your not going to bring up Libya when W Jr can be left accountable not only for the death of hundred of thousands of Iraqi's as well as the thousands of dead Americans and all for what? war profiteering for his cronies?????? and that's just in my lifetime. (eye roll). What a drama queen...First of all, you clearly haven't lived very long. Republicans don't have sole propriety over getting the US into wars, and I'm going to go out on a limb here, and say that not all wars have been popular with all people all of the time. Even WWII, in which FDR (a Democrat, btw) got a lot more of our boys slaughtered than either of the Bushes, which was a "'popular" war wasn't very popular with the Japanese who got rounded up and confined. But I wasn't trying to make the point about getting soldiers killed, only equating Obama's deadly cover up with Nixon's non-deadly one. And look who took the bigger beating over it. Nixon attempted to subvert democracy – what criteria do you use to determine the quality of an American President? Not trying to defend Nixon. But I'll take a non-deadly subversion of democracy over a deadly one any day. Agreed he was on the right side of history, Kennedy was also working for the good of the country, when compared to the current occupant of the Oval Office, there is a stark contrast - Obama is clearly working for his own glory with the country being secondary. I suppose this will be the beginning of a long line of secret tape collections, to include "The Secret Tapes of Eisenhower," The Secret Tapes of FDR," The Secret Tapes of Gerald Ford" etc. kennedy wouldnt even make it through the democrat primaries today. @max3333444555, I think you got Kennedy confused with Reagan. It's Reagan who would not have made it out of the republican party. Obama is very similar to Kennedy. In fact Obama is a mix between Kennedy and Abraham Lincoln. I wondered about Obama, I use to think he is like Hitl** from world War II. I am not sure anymore? Without the TelePrompTer he isn't such a great speaker as I thought. He is just a plan old Joe. To say that he matches up to Kennedy is a bit of a stretch. Kennedy stood up to people and was a statesman. Obama doesn't do either of those things. Kennedy never bowed to the enemy. Seriously? Would not have bowed to the enemy ...you have no proof of that. But just think Sen John Mcain and the rest of the republicans would have critisicized Kennedy over his handling of the cuban missle crisis, by saying using a quarantine approach is weak even though there were Bombs in cuba courtesy of Russia. To all on Vietnam, Kennedy order to pull out 1000 MILITARY personnel, but post coup, during the trip to Dallas, the feeling was that US would have broader support with the new group and he ordered a complete review, escalation and withdrawal. When Robert Kennedy was asked in 1964 what his brother would have done if the South Vietnamese had been on the brink of defeat, he replied, "We'd face that when we came to it." Yes, the navy blockade successfully blocked missiles in Cuba. It is a LONG stretch to say that mean nuclear war, but he made the deal for the Turkey missiles and prevented an ongoing crisis. He also approved the Bay of Pigs. Obama and JFK are about as different on the political stage as Reagan was from Carter. "When JFK took office the Eisenhower administration, through the CIA, had begun formulating plans for the assassination of Castro in Cuba and Rafael Trujillo in the Dominican Republic. Kennedy privately instructed the CIA that any such planning must include plausible deniability by the U.S. His public position was in opposition to his actual orders"
Obama will be seen correctly by historians as a mix between Jimmy Carter and Richard Nixon. Like Nixon: For his corruption (giving Billions to bankers and Solyndra) his coverup (the Benghazi gate scandal and lying), and Carter for his weakness and apology tour, his cow towing to the Russians, disparaging speeches to the European community where he puts blame on the USA, etc. He is a disgrace for those of us whose families who have fought and died for freedom. You really have no clue and lack any objective intellect if you are trying to mention Obama in the same sentence as Lincoln. Max- You're out of mind if you believe that Kennedy -who still owns the title of the most charismatic politiciain in our nations history,- "would not make it out of a Democratic primary today" You clearly do not understand what it takes to make good politcian and you not at all a very bright person- this is a case of the light is on but no one is home for sure. JFK was a tragic figure. free world, during the height of the Cold War. So you're saying the Kennedys were murdered by Castro? conclusion. What Oswald did and who he met in Mexico in 1963 is key to the mystery. At least in my humble opinion. – how about the Miami Cubans ? and paid a very high price for the aborted invasion. I often wonder where would our country be today if he had served two terms as president. I think we would have been better off. I agree with you Bill. Kennedy wanted to get us out of Vietnam and would have done so. We'd be a different country today if he had. JFK of course, was the one who raised the US profile, and was fully vested into protecting South Vietnam. The chance to rewrite history here for the "JFK myth" believers is too intense. The reality is, that he would have been lampooned in the press for being soft on communism by not supporting the South Vietnamanese. 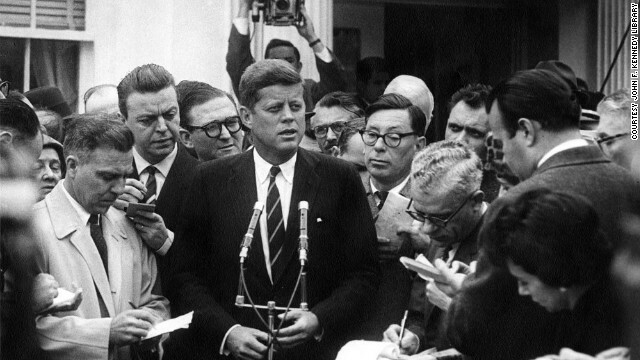 USSR was a real and present danger threat, and JFK fully supported a strategy of containing Communism. Communism impacted the US powers to influence world events, and that was the real agenda. Fiscally, he sounded like a current GOP candidate. He was a complex guy whose actual accomplishments as President offer very little reason for the worship he receives today. Interestingly, for a guy as disengaged as he was with the details, he was his on Chief of Staff. As an executive and as a lawmaker, his ability to reach across the aisle and influence was limited, he was pretty ineffective in anything he took on except lowering taxes. LBJ was much more effective, and he had no interest in getting more involved in S Vietnam either. This was a time of your neighbors building bunkers, economic growth, and school children practicing bomb raids. Airplane travel was glamorous, and people dressed up to fly. On the other hand, if he had lived, we would have been spared the Oliver Stone movie..
Actually, in his first 24 hours in office LBJ overturned JFK's decision to stay out of Vietnam. LBJ and the other powers that may be, wanted that war – not JFK and certainly not Bobby. He was president two years, ten months and two days. We are all judging this man before his "at bat" was up. But I do believe this country would have been better off had both Kennedys a chance to finish their go at the plate. Wrong...get your facts right. National Security Action Memorandum Number 273 clearly stated US troops were to be pulled out. 4 days after Kennedy was buried Johnson reversed that order. Rheferro, you obviously did not live during the Cuban crisis and do not realize that without Pres. Kennedy we would have been in a nuclear war. John ,the country would still be the same because he would never have survirved the multiple attempts on his life which surely would have been made on life by the military industrial complex. The only way it would have been a different country would be in Kennedy found a way to neutralize the members of the military industrial complex who had him whacked in the first place. A very sad, but true fact of life. Kennedy became a great president after his assassination. You really need to pick up a history book. You can type. So you must know how to read. No, actually eroteme is correct. Kennedy's popularity picked up after his death. During his presidency it was very much like it is today, many people who liked the president (e.g. you, Bill) and many more who thought he was a horrible president. And as hindsight often proves, he was actually one of the best presidents this country will ever know. Contradicting my own opinion, his job was also unfinished. So who are any of us to judge? His portrait was unfinished. Sadly, the only good Kennedy, seems to be a dead Kennedy. How clever. Can I quote you? You cannot judge these men as their potential was violated and extinguished by hate. Both Bobby and John had the best intentions for all human beings. We have never seen such compassion in a politician since. And probably never will. Pick up a book and read. Bobby Kennedy, especially, could have changed this country and this world for the better. 100% Agree. The world would have been a better place had the brothers not been killed – but wanting peace and a better life for the majority, isn't something the minority elitists agree with. ....then screw the "minority elitists". "Stay in Cleveland..as there are lots of of us that liked JFK and his brother Bob.." "You belong there!"